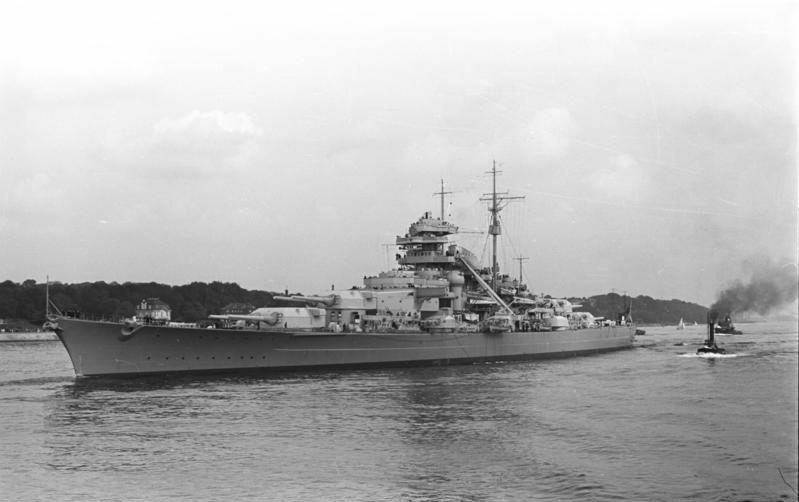 The Bismarck had to be sunk. It posed a huge threat to Allied shipping. And it had just sunk Britain’s Hood. 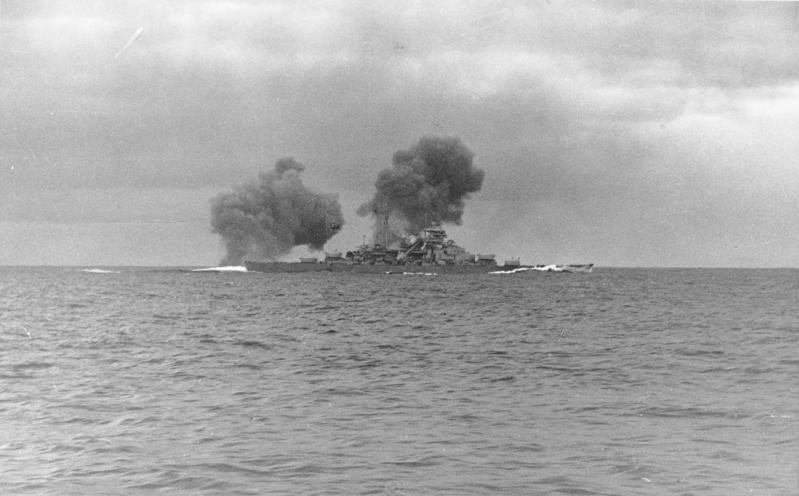 Bundesarchiv_Bild_193-04-1-26, Bismarck firing during the May 24 battle. In a reenactment of David and Goliath, a tiny, flimsy Swordfish biplane torpedoed the 50,000-ton battleship. The torpedo jammed the mammoth ship’s rudder, rendering steering impossible. The German ship can only wait for the British ships to circle round and tear it to shreds. Late on the night before the deadly encounter, Captain Lindemann tells his crew they may take whatever they want from the ship’s stores, everything from cheese and chocolate to Swiss watches and fountain pens. He knows they’re doomed. May as well have a bit of cheer. During the night, U-73 finds the crippled ship and watches the British destroyers shadowing the Bismarck dart in and away to fire on the ship. They don’t expect to sink it, but can prevent the men from getting any rest. Where was U-73 when the British capital ships tore their compatriots apart and left hundreds in the sea? The battle raged for ninety minutes on the morning of May 27, 1941. The Bismarck fired its guns but, unable to manoeuver, couldn’t land any hits on the British ships. They scored countless hits in the sustained bombardment. The ship was on fire from the continuous shelling. Crewmen leaped overboard. British sailors saw possible semaphore blinking, arms waving in semaphore. A black flag fluttered, We want to parley with you. This were ignored. The ship still flew its colors; some guns still fired. Crewmen in the most vulnerable parts of the dying ship may have attempted to capitulate. Warped hatches and doors block exit routes. A shell exploded in the compartment medical staff worked on the wounded, killing everyone. Sailors trapped in an ammunition magazine drowned when the magazine was flooded to prevent a threatening fire to trigger an explosion. The Bismarck had become a charnel house. Did so many have to die? Several among the British wanted the slaughter to cease. A chaplain said to a captain, “You are firing shells at a ship that can’t reply.” The captain replied, “You go and mind your own business and get off my bridge.” The killing brought revulsion to men imbued with British fairness. The shelling finally stopped. Torpedoes were fired to send the wreck to the bottom. Two destroyers picked up 111 survivors. The warning of a U-boat nearby caused the destroyers to clear the area immediately after throwing life rafts to the hundreds still in the water. This may have been the U-74, sent to retrieve the Bismarck’s war diary. The U-boat picked up three sailors; a German weather ship found two more. Out of 2,365 crewmembers, 116 survived, although one died of wounds while aboard the destroyer. 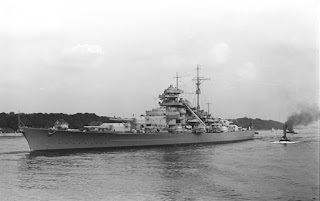 The Bismarck had to be sunk. The British couldn’t capture it. Not with U-boats and Luftwaffe bombers rushing to the Bismarck’s defense. Not after 1,418 British sailors died three days earlier on the Hood, with only three survivors.